For some, this weekend marks the start of the holiest of seasons here in Wisconsin, otherwise known as deer hunting. That means an estimated 650,000 blaze-orange clad hunters will take to the woods in pursuit of the state’s 1.4 million deer. What could go wrong? In Wisconsin alone, for 2012, there were nearly 19,000 reported car/deer accidents, resulting in 445 people either injured or killed. According to the National Highway Traffic Safety Administration, there are about 1.5 million car accidents from deer collisions annually that kill 200 Americans, cause more than 10,000 personal injuries, and result in $1 billion in vehicle damage. Car/deer accidents peak during the mating season (October through December) when deer are most active. However, accidents also spike in spring when young deer begin to move around on their own. One NMA staffer experienced a particularly nerve-wracking deer collision one June right near the office. The result? About $3,000 in vehicle damage, insurance hassles and one very dead deer. 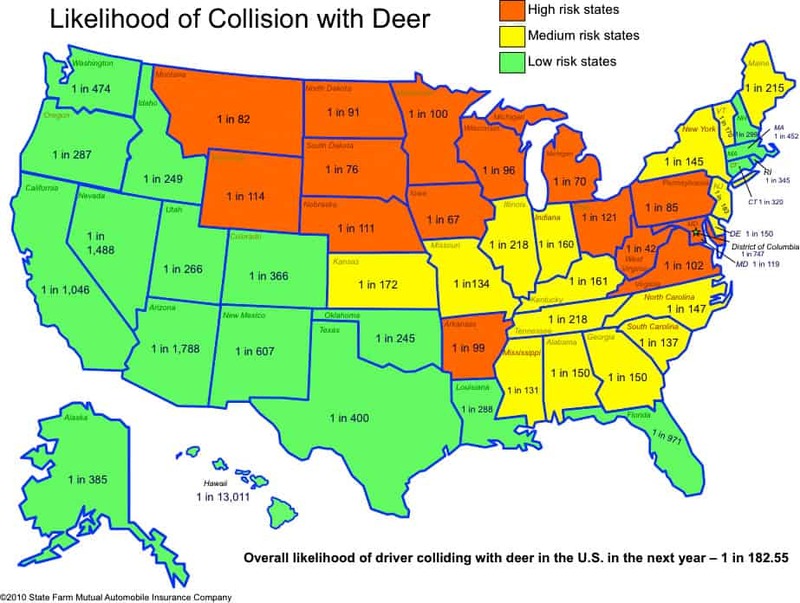 So, what can you do to avoid a dangerous and expensive collision with the ubiquitous Odocoileus virginianus? Most deer collisions occur between sundown and midnight, and just before and after dawn, so pay extra attention during these periods. On a multi-lane road, if you won’t impede traffic, consider moving to the left lane (this is one of the few times you’ll hear us recommend this). This creates a “buffer zone” on each side giving you more time to react should a deer pop out. Deer travel in herds. When one crosses the road, others are likely right behind. For a few more tips, review some prior newsletters here and here. Sorry, no venison recipes included. On a different note: Check out our new state-based forum pages on the NMA Forums.